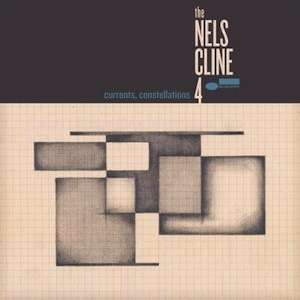 Personnel – Nels Cline: guitar; Julian Lage: guitar; Scott Colley: bass; Tom Rainey: drums. Whether digging into glam pop songs, avant-jazz routines with punk attitude, or sophisticated garage-rock episodes, impetuous guitarist Nels Cline, a creative powerhouse in small group settings, always sounds unique and fetching. Blue Note’s Currents, Constellations marks the debut of The Nels Cline 4, a quick-witted group featuring Julian Lage on guitar, Scott Colley on bass, and Tom Rainey on drums. Both guitarist and drummer had recorded with Cline before, whereas Colley is the novelty here, feeling totally comfortable in the new job. “Furtive” kicks off with one single guitar stroke followed by an artsy drumming demonstration. 30 seconds later, an unstoppable, frantic bass ostinato glues to the drums, upholding the highly contrapuntal work of the two guitarists, whose directions occasionally converge into parallel motions. Stylish rocking riffs and fervent avant-garde moves are on full display. That mood has nothing to do with the mutable jazz-rock jammer “Swing Ghost 59”, which swings with conviction from time to time, opening a space for Colley's improvisation before falling into a quiet guitar-driven passage. Surprisingly, the band plunges into a bluesy, retro-swing movement that seamlessly morphs into a type of Jimi Hendrix’s Foxy-Lady-rhythm for the finale. A prolonged jarring drone opens “Imperfect 10”, a composition with a catchy theme impregnated with awesome and complementary guitar licks extracted from different octaves. Cline channels his energy through his habitual inventiveness of sound and surprising chops, while Lage, known for a more formal posture, fills the atmosphere with a bold rocking reverie. Hauntingly beautiful, “As Close As That” was inspired by guitarist Ralph Towner and interweaves mystery and tenderness with a remarkable honesty. Like an alternative pop/rock ballad, it favors space over density, just like “River Mouth Pt.1 and 2”, where textural explorations overcome any searching or confrontational postures. The first part of this composition carries celestial non-angularities, making us wander among the stars, while the second, predominantly folk, evokes Towner once again, sounding ennobling and spontaneous. “Amenette” was first heard on Room (Mack Avenue, 2014), the magnificent duo album by Cline and Lage, but here was re-interpreted with richly contrasting instrumental approaches. The quartet alternates between ferociously swinging and discreetly laid-back, with the soloists often taking their actions to the edge of dissonance. When the experimentation takes over, Rainey shows how masterful he is in the art of tom-toming, and everything ends in an electric fizz before the theme rings again. On Carla Bley’s rare and temperate “Temporarily”, the melodic juxtapositions from guitar and bass are anchored by rich chord voicings, and brushed drumming patterns. There’s a deep sense of understanding among the musicians and that reflects positively in their nimble moves and sounds. The levels of abstraction in Currents, Constellations makes it more indisputably alluring than any recent project led by Cline, who has here one of his best albums since the masterpiece New Monastery.